Former Democratic Gov. Terry McAuliffe (Va.) on Monday said he doesn't want Democrats going out on the campaign trail in 2020 making "false promises" like free college. McAuliffe, who said he will make a decision on 2020 by the end of March, said Democrats don't need a "compulsive liar" running against President Donald Trump, but instead a "compulsive optimist" and a "compulsive realist," appearing to hint American voters need him. 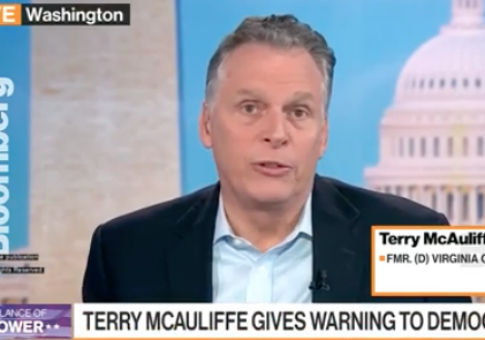 Bloomberg's "Balance of Power" host Jason Kelly referenced McAuliffe's Washington Post op-ed from last week, where he said Democrats must not "make unrealistic ideological promises." He then asked McAuliffe which policy proposal from his op-ed was the most "feasible." "Americans are looking for a president who tells the truth … We don't need a compulsive liar. We need a compulsive optimist and a compulsive realist who will actually get things done, who will deal with the kitchen table issues that families are concerned about," McAuliffe said.